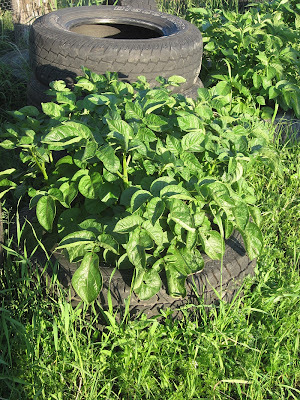 It was long past time for me to put another tire on my potato towers. 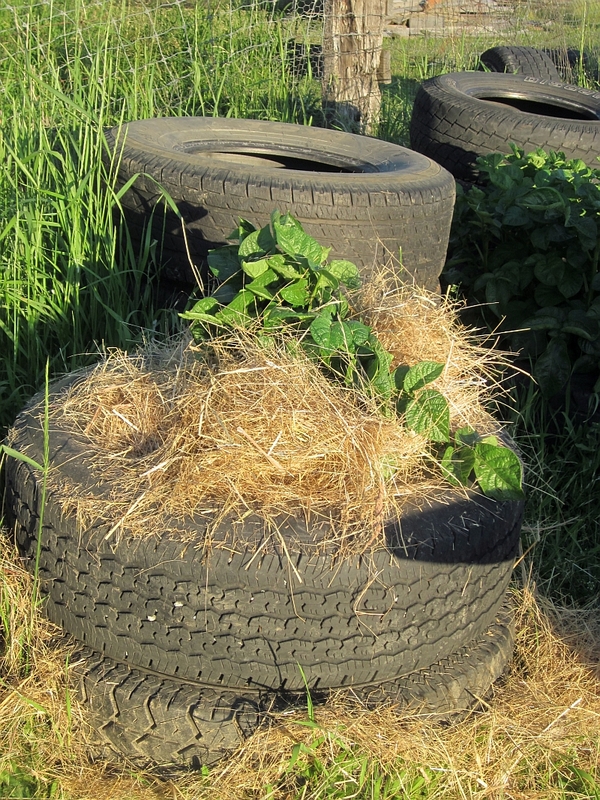 The idea behind potato tires is you keep adding tires on top of the plant, and the potato plant will grow upwards, filling the tire with potatoes as it goes. 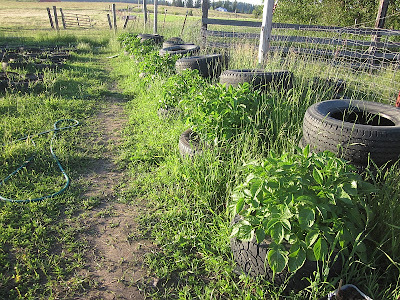 In the fall you remove one tire at a time and harvest the potatoes as you go. This is a handy technique for those who have limited space or, in our case, for those who have plenty of tires. 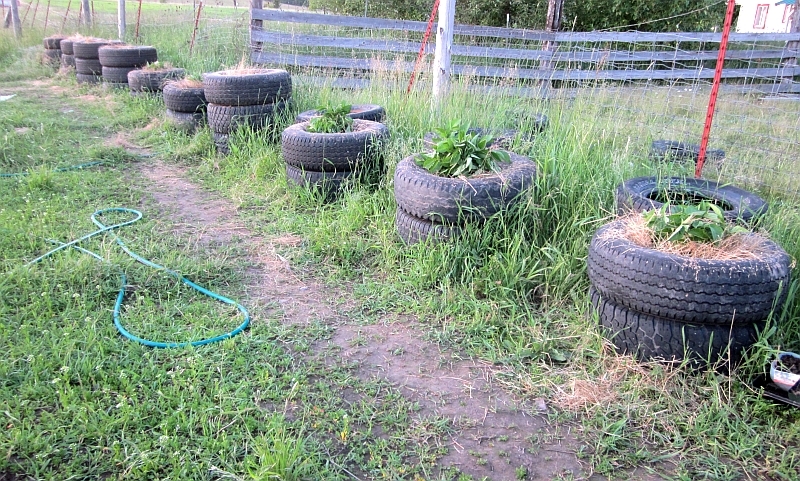 I had already pulled aside three extra tires of similar size for each plant from the last shipment of tires we got. 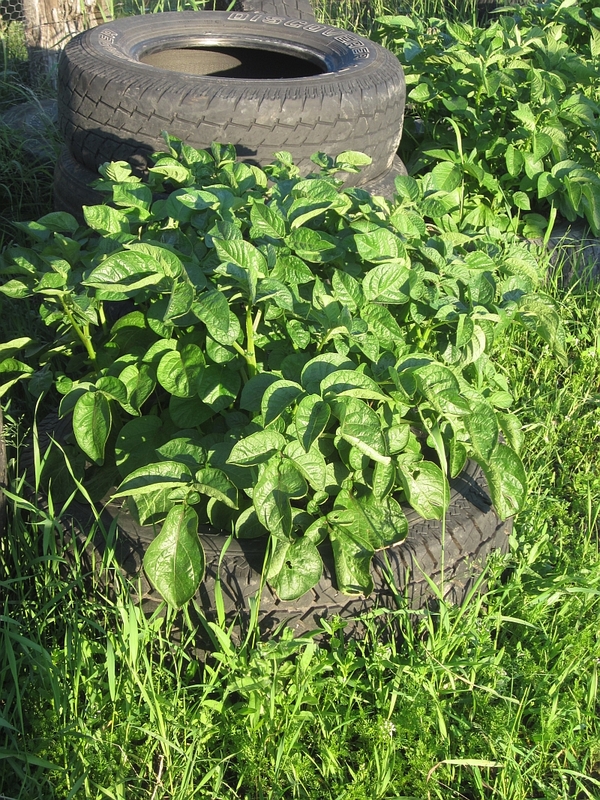 These were stacked behind each potato plant, waiting their turn. 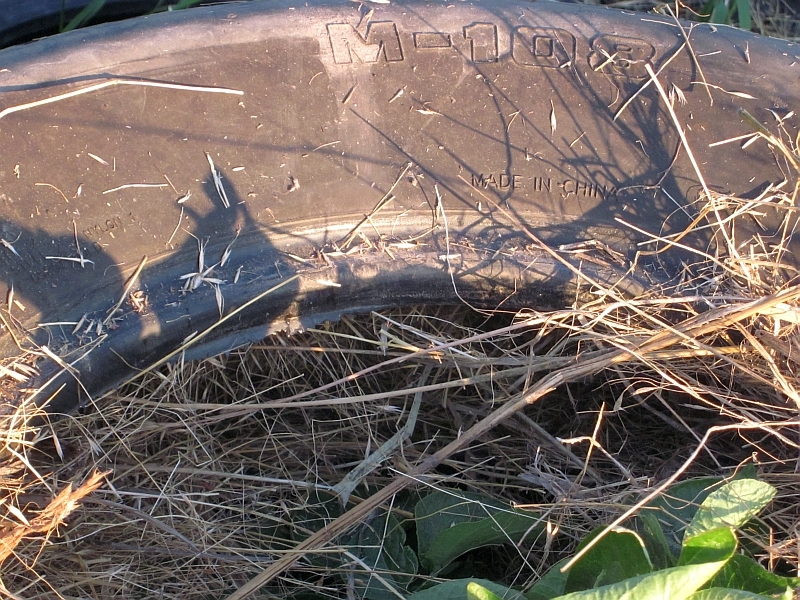 It was a two-person job to stack the next tire onto the tower, only because the plants were so luxuriantly big. 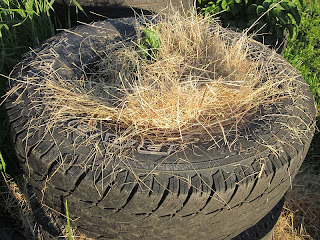 Younger Daughter sort of gathered the plant together, bouquet-style, while I carefully placed the next tire on top the bottom tire. Then she made sure the leaves were all tucked inside as I settled the tire down. After that it was time to fill the second tire. The stacked tires can be filled with dirt or with straw. 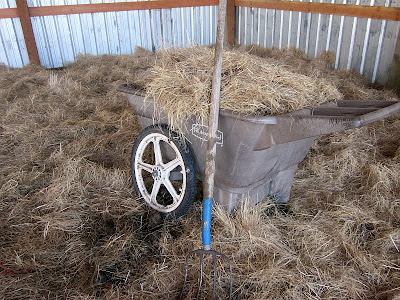 We have lots of straw, so I used that. ... making sure the sidewalls were thoroughly filled. 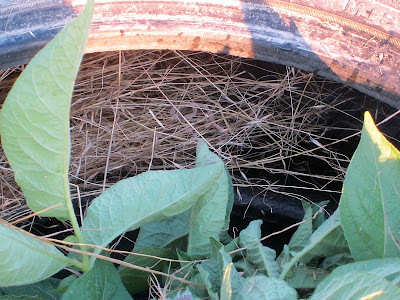 This is what the second tire looks like, stuffed with straw. 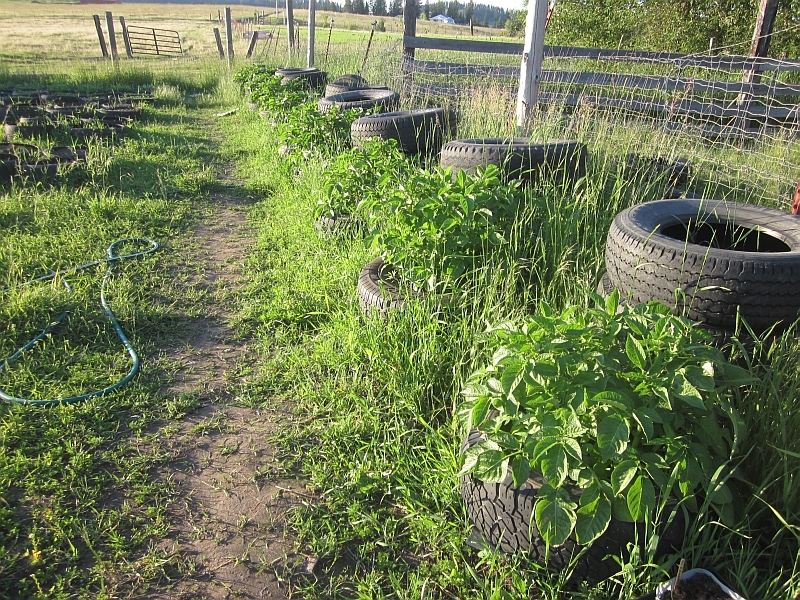 But some of the plants were so tall they were actually ready for the third tire. After thoroughly stuffing the second tire, I added the third tire and stuffed that, making sure the tops of the leaves were poking out. While I worked, the sun went down. 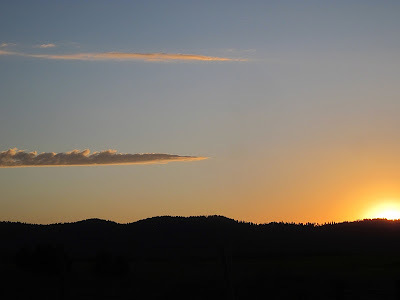 It was dusk by the time everything was finished, but I'm glad we got this done when we did since today has been a day of pouring and unrelenting rain. Your potatoes are looking awesome. Can't wait to see how your harvest turns out! Thanks for the update. Your technique is very intriguing and something I will have to try. Oh, my! We've had 20" of rain in the past two days (with more on the way). I suppose I should've planted rice this year. What about snakes? That straw just seems like the perfect place for them live - anyone ever have a problem like that? If you fill the tires with straw instead of dirt, does it act like an organic "hydroponics mesh" to allow growth and support the weight of the potatoes? Send some of that rain this way. Grass isn't supposed to be crunchy. Just thought of what a " Goodyear " this garden might be ! ..but only if you use Good,rich soil. 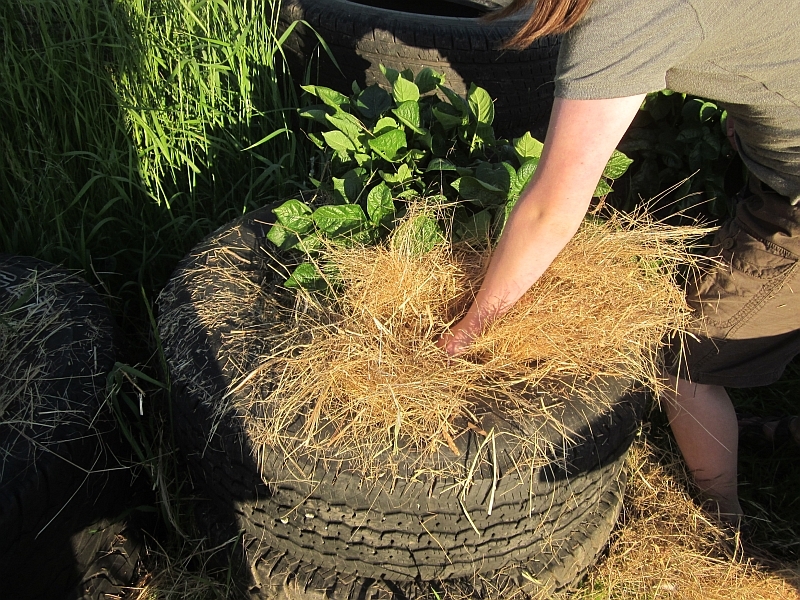 We ended up losing most of our potatoes to mice the year we filled the tires with straw. Hope yours work better than ours did! We've had a long drought, and some fires here were burning for over a year. I been wanting to do this with potatoes, but I am scared of toxins leaching out of the tires. Do you know of any research that has proven that is not the case? I would be very grateful. From everything I've been able to find, any potential toxins are bonded into the tire structure itself, and therefore can't be released until the tire itself degrades... which may take decades (if ever). 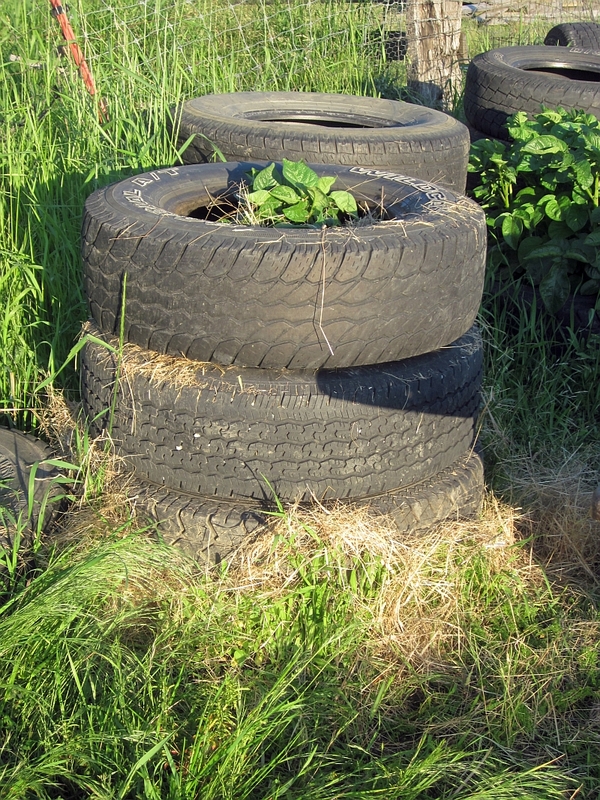 Tires are actually remarkably inert items, which is unfortunate for disposal but ideal for gardens. I have heard of this with Sweet Potatoes, but does it work with all variety of potatoes? Also, do you plant anything else in your tires? Looks like and easy "raised bed" to me. Nice idea! I like your values, and what you're doing altogether! right now we're in the middle of snow and ice in New York, and I was looking at gardening websites for some respite! This was great. G-d bless you!